My friend Thomas had ridden off down the trail ahead of us to shoot a video as we all shralped the descent, but a minute later he rode back up to let us know that there was a rattlesnake chilling in the middle of the trail. It was so thoughtful of him to keep us from bombing down at breakneck speed right over this venomous viper! I had never seen one before, so I was pretty stoked to check it out... but I gotta admit, I did not want to get close! There is something very sinister about a creature so small that can catch you unawares and kill you with it's venomous bite. I'd almost rather encounter a moose or a grizzly bear out on the trail than accidentally run right by a snake and get bitten because I didn't see it. So needless to say, Matt shot this photo... I did not get this close! 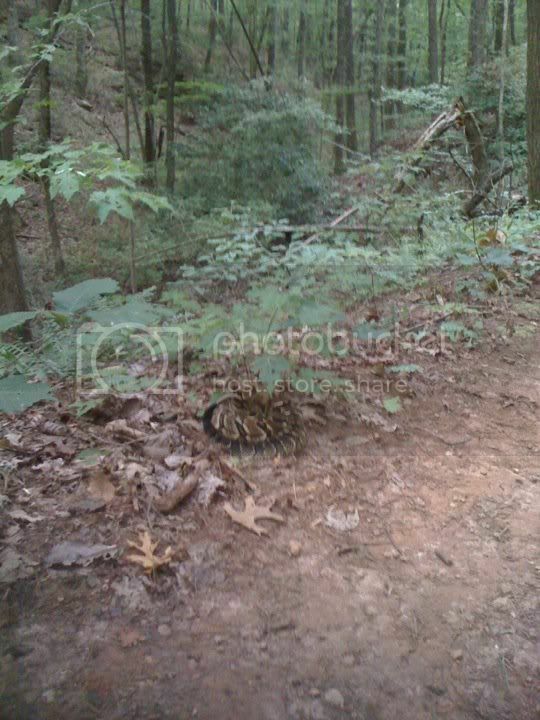 But when I rode by (as far off the right side of the trail as possible), I could clearly see the warning rattles lying on top of his coiled body. Thankfully, they weren't shaking! I don't usually think about rattlesnakes living in Georgia... but they do! The specific species is the timber rattlesnake, and according to this article they can be found all across the state. Stay safe out there! Found a nest of them living in a small cave/openeing while biking the Tanasi trails. Got off the bike to "lighten the load" and heard the very distinctive rattle. Froze in place and saw a small 2-3 foot long rattler about 12 feet ahead of me just outside of that opening in the rock. I backed up to give him his space and sat there and watched for a few minutes. 4 of his buddies came out to warm up in the sun over the next few minutes. BTW, rattlers aren't the only poisonous snakes in GA. We also have cotton mouths (water moccasins), copper heads, and coral snakes so keep your eyes open. Snakes are scary stuff out there. I don't think about them too much on the trails up here in Massachusetts but last time I was down in Florida I was bombing down a trail and as I come around a corner I throw on the brakes and skid to a stop because my buddy had his bike down in the middle of the trail and was backing away slowly. I looked ahead and there was a rattlesnake taking his time crossing the path... we waited patiently!! @Jeremy, woa, that's crazy! Did you ride the other way? As for other breeds, if it looks like a snake, I just leave it alone! @eastwood, yeah I'm definitely never going to mess with one! Living out in Colorado gives mea special appreciation for Rattlers. I grew up in Florida, but out here they come out early morning and late afternoon to sun on the trails. I have been barreling down at breakneck speeds as well, however i remember having to jump over one and swerve around another for fear that stopping might have gotten me bit!!! Gone Riding, but the Posts Shall Go On! Videos of the Airborne Flight Crew Thrashing!